In Erich Maria Remarque’s classic war novel, All Quiet on the Western Front, German soldiers receive their ration of synthetic honey and play cards on the lid of a margarine tub. As a modern, industrialized butter substitute, margarine was a depressingly suitable food for the world’s first modern, industrialized war. Butter had been adulterated before — with carrot or turnip or lashings of salt, to hide its rancidity — but margarine made it wholly artificial. Born in a laboratory instead of a cow, it was at the vanguard of the artificial tinned, tubed, canned, bottled, and dyed food blitzkrieg of the twentieth century, which turned cuisine into chemistry. Margarine thrives on adversity, and its origins are rooted in it. Margaret Visser’s Much Depends on Dinner provides a first-rate account of the circumstances leading to its invention. In 1869, a cattle plague in France prompted Emperor Napoleon III to offer a prize to anyone who could come up with a butter substitute to feed his army and people. Hippolyte Mège-Mouriès, the food chemist who won the prize, had impeccable credentials, having already developed a widely honored process for “making more bread with less flour.” His substitute for butter was an amalgam of beef tallow, milk, and udders, pressed and heated in his laboratory. Initially called oleomargarine (after oleic acid and margaric acid), the name was shortened to margarine (margarites means pearl in Greek, and the fatty deposits of margarine had a pearly sheen). Over the years, beef tallow was replaced by vegetable and cottonseed oils, and yellow dye was added to turn margarine’s unappetizing white lardiness into a more buttery yellow. 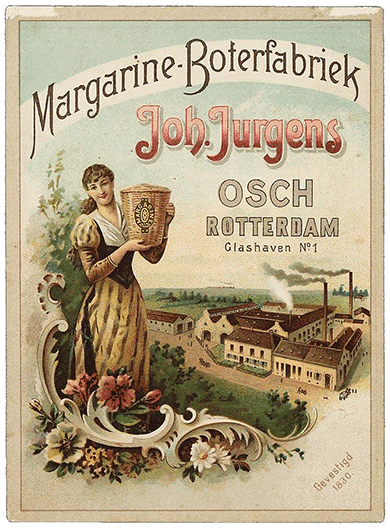 It arrived in the United Kingdom as Butterine, but the aural kinship with butter was too close for England’s dairy farmers, and an 1887 law changed the name to margarine, soon cockneyfied to marg. The First World War changed everything. Even the upper and middle classes had to eat margarine. War rations were introduced to manage food shortages, and in England dairy was particularly hard hit, with German submarines torpedoing butter imports from Australia and New Zealand. As blocks of butter sank to the bottom of the ocean, the fortunes of margarine rose steadily. Rudyard Kipling captures this in Changelings, a poem about a butter-selling grocer’s clerk who enlists with the navy and returns after the war to his grocery. Despite the rueful mockery that touches this seemingly lighthearted ballad, it was written in the shadow cast by the death of the poet’s beloved son, John. Kipling had pulled strings to get John enlisted and never forgave himself for pushing him toward the trenches. The jingoism that made Kipling a pillar of the War Propaganda Bureau is absent in this fine poem. What were all those deaths for, the poem dryly asks, if they only returned us to a cut-rate margarine version of peace? From Harper’s Magazine, January 1918. Subscribers can also read “The Oleomargarine Rebellion” (December 1943), about the battle between margarine and butter producers in America. In the last two years of the war, Germany was even further reduced, to a state of “ersatz ersatz”: all the finer substitutes had been exhausted, and in their absence all kinds of dubious surrogates were packaged as food. Washing soda mixed with starch, for instance, was sold as butter — it came nicely packaged with a grand name that fooled no one. Ersatz food not only caused an outbreak of physical illness called ersatzkrankheit or “substitute sickness,” it also led to widespread feelings of moral inferiority and insubstantiality among the German people. The unrelenting diet of fake foods made them feel like fake people. “People started applying the term ersatz to everything, even themselves,” writes Wilson. “An Ersatzmensch was a substitute person, a simulacrum of a human being, who was no more real than the Ersatzbutter they spread on their Ersatzbrot.” Germany’s national memory of hunger and debasement in the First World War played no small part in stoking the vengeful rise of Nazism, though the Nazis were themselves to champion ersatz-ism as an act of patriotism during the next war. The more indigestible irony of our times is that the once-disparaged ersatz butter has come to be regarded as a healthy food. Because of its relatively lower saturated fat content, margarine has gone from being the shortening of those with slender means to the shortening of the slender. No wonder, then, that the cultural theorist Roland Barthes wrote a critique of mass culture called “Operation Margarine.” In the end, he argued, the imitation is always embraced over the original, and precisely for the qualities it lacks. Nina Martyris is an independent journalist. She has written for the Times of India, the Guardian, The New Republic, The Los Angeles Review of Books, Guernica, and several other publications.